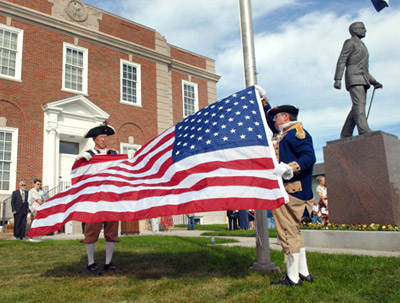 The Harry S. Truman Color Guard attended a ceremony sponsored by the Independence Pioneers Chapter, Daughters of the American Revolution, in which the Chapter donated a new flag to be hung outside the recently renovated Jackson County Truman Courthouse. 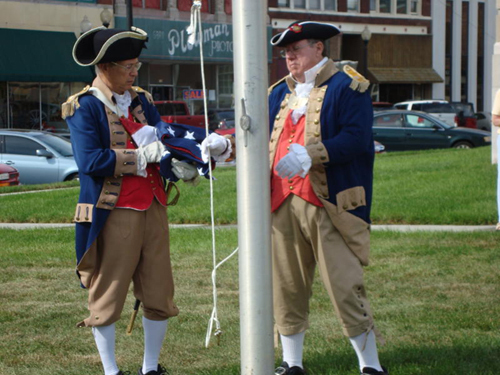 County Executive Mike Sanders accepted the flag on behalf of Jackson County from the Independence Pioneers Chapter, during a special dedication ceremony held on Friday, September 18th. Carolyn Grover was part of this program, reciting the Pledge of Allegiance and Americans Creed. Over 40 local guests and residents attended this event. The raising of the flag was a triumphant signal, Sanders said, that this summer's vital renovations on the courthouse have saved the national landmark from irreparable harm. 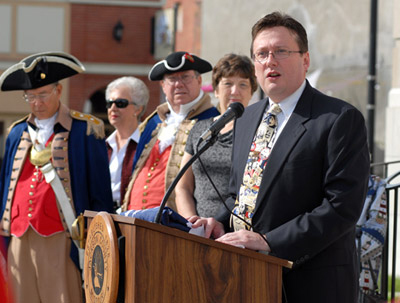 In January 2009, Sanders declared a public emergency to free up funding for the renovation work, which entailed removing a 1972 retaining wall and repairing damage to the foundation caused from the wall continually trapping water around the building. Furthermore, the courthouse grounds have been restored to their appearance in 1933, the year Harry S. Truman, then a Jackson County Presiding Judge, oversaw the remodeling of the historic courthouse. Left photo (L - R): Major General Robert L. Grover, MOSSAR Color Guard Commander; Marguerite A. Jenkins, Captain James L. Scott, Mrs. Carolyn Grover; and County Executive Mike Sanders. Center photo: (L - R): Major General Robert L. Grover, MOSSAR Color Guard Commander and Captain James L. Scott. Right photo (L - R): Major General Robert L. Grover, MOSSAR Color Guard Commander; and Captain James L. Scott.